De, T. (2012). Glycophosphosphingolipid (GSPL) Purification Protocol. Bio-protocol 2(23): e299. DOI: 10.21769/BioProtoc.299. Karmakar, S., Bhaumik, S. K., Paul, J. and De, T. (2012). TLR4 and NKT cell synergy in immunotherapy against visceral leishmaniasis. 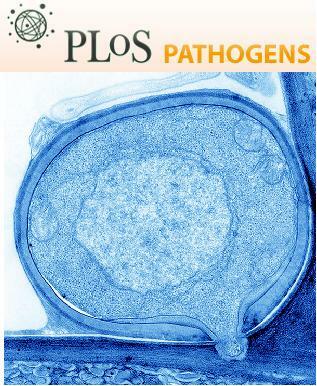 PLoS Pathog 8(4): e1002646. Glycosylated ceramide phosphorylinositol are present in many species of fungi and mushrooms and bacteria and parasitic organisms like leishmania. These are usually membrane raft associated and are not easily extracted by conventional methodologies. This extraction method gives higher yield of the glycolipid. Glycosphingolipids are usually associated with the detergent resistance membrane rafts. They are difficult to be extracted by neutral solvents from rigid promastigote cell wall with neutral or less polar solvents. For more polar phospholipids, more polar solvents are essential. Ammonia is used to extract phosphatidylinositols. Promastigotes of L. donovani, strain AG83, are grown at 22 °C in medium 199 (pH 7.4) supplemented with 10% heat-inactivated FBS, 2 mM l-glutamine, 100 U of penicillin G sodium, and 100 μg of streptomycin sulfate per ml and subcultured in the same medium at an average density of 2 × 106 cells/ml. Cells are harvested after 3 days of growth by centrifugation at 1,500 x g for 10 min. Harvested cells are washed twice with PBS (10 ml, 1,500 x g, 10 min). Take up promastigotes (1 g wet weight) in 50 ml of chilled 50 mM Tris-HCl (pH 7.4), containing 2 mM PMSF (Phenylmethanesulfonyl fluoride) in glass tubes and keep on ice. Tube is mixed by mildly vortexing six times on a cyclomixer and kept on ice for 10 min in between each vortexing. Time of vortexing is 2 min each. Collect cells by centrifugation at 3,300 x g for 20 min at 40 °C and wash extensively (3-5 times) with PBS (20 ml each). The pellet is re-suspended in 10 ml of a 5% sucrose solution in 50 mM Tris-HCl (pH 7.4). 5 ml of this solution was layered onto a 10 ml solution of 25% sucrose in the same buffer in a corex tube. This is centrifuged at 1,500 x g for 30 min. The pellet formed was again taken up in 2.5 ml of 5% sucrose in 50 mM Tris-HCl (pH 7.4). And layered onto a 5 ml 25% sucrose solution in the same buffer. This is centrifuged at 1500x g for 45 min and the pellet (membrane ghost) was processed further. Promastigote membrane ghost (1 g wet weight) is mixed with 19 volumes of chloroform:methanol:ethyl acetate:pyridine:4.5 N ammonia:water (15:15:5:0.5:0.5:0.5, v/v) and homogenized by 18-20 strokes in tight fitting Dounce-type homogenizer (on ice). The tube is kept on ice for 10 min and then sonicated in a bath sonicator (30 x 20 sec). Tube was kept on ice for 30 sec in between each sonication. Concentrate (to dryness) the extracted material by rotary evaporation, dissolve in 1 ml PBS-AT by sonication in a water bath (5 x 20 sec, with 30 sec intervals inbetween) and load onto a column of DEAE-Sephadex A-25 (0.5 x 5 cm) equilibrated in 0.01 M phosphate buffer (pH 6.4), containing 0.05 N ammonium hydroxide and 0.1% sodium salt of taurodeoxycholic acid (PBS-AT). Wash the column with 5 ml of PBS-AT and elute anionic glycolipids with a linear gradient of KCl (0-0.1 M in PBS-AT). The gradient is produced by mixing Anion-exchange buffer PBS-AT (no KCl) with PBS-AT containing 0.1 M KCl. Note: 10 times the column volume is used to prepare the gradient. For example: For a 2 ml column, a 20 ml gradient is used. To prepare this gradient, 10 ml of PBS-AT without salt is placed in the container that pumps into the column and 10 ml PBS-AT (containing 0.1 M KCl) is placed in the other container. Line the developing chamber on the inside with Whatman 3 mm paper. Equilibrate the developing chamber with ~100 ml solvent for ~ 1 h. Spot 20 μl fractions on a HPTLC plate and develop in chloroform:methanol:0.25 N ammonium hydroxide in 0.25% KCl (65:45:9, v/v). Identify glycolipid containing fractions in an iodine chamber. To prepare the iodine chamber, add a piece of filter paper and a few crystals of iodine in a dry TLC jar. The jar soon becomes saturated with iodine vapors. Insert the TLC plate inside the jar. Glycolipids appear as dark brown spots. Pool fractions containing glycolipids together and precipitate glycolipids with 1 volume of acetone. After 3 days at 40 °C to allow the precipitate to settle down, decant the supernatant carefully, wash the precipitate with acetone and air dry. Take up the dried precipitate in 1 ml of Chloroform:Methanol (9:1, v/v) and load onto a silicic acid column pre-equilibrated in chloroform (10 g silicic acid/g lipid). Sequentially elute the column with 10 bed volume each of chloroform and then Chloroform:Methanol (8:2; 7:3; 6:4; 1:1; 4:6; 3:7; 2:8; v/v) and finally with methanol (10 bed volumes). Monitor the fractions by TLC and further purify the fraction containing the desired glycolipid (GSPL) by affinity chromatography on an erythina cristagalli-agarose column (1 ml) pre-equlibrated in PBS-AT (In our case the presence of the desired glycolpid was monitored by its antileishmanial efficacy in the in vitro infected macrophage model). Wash the column with 10 bed volumes of PBS-AT and elute the glycolipid with 5 ml of 0.1 M galactose in PBS-AT. Dialyze the galactose eluent against PBS at 40 °C for 8 h with frequent changes, and finally lyophilize. Take up the lyophilized material in C:M (100 μl, 2:1, v/v) and precipitate with acetone as before. Cells collected by centrifugation from step A-2, was taken up in 5 ml of 5% sucrose in 50 mM Tris-HCl buffer (pH 7.4). 5 ml each of this suspension was layered on to a 10-ml cushion of 20% sucrose in the same buffer in a corex tube. These were centrifuged in a swinging bucket rotor at 1,500 x g for 30 min. The band at the interface consisted of the flagella, and the pellet formed consisted of membrane ghosts. To a 0.01 M potassium phosphate buffer containing 0.15 M NaCl (pH 6.4), ammonium hydroxide and sodium salt of taurodeoxycholic acid was added to a final concentration of 0.05 N ammonium hydroxide and 0.1% sodium salt of taurodeoxycholic acid. This protocol is adapted from Karmakar et al. (2012).